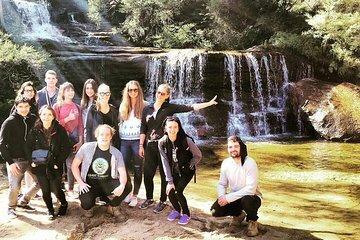 Si vous optez pour une seule journée au départ de Sydney, faites une excursion d'une journée dans les Montagnes Bleues, en vous arrêtant dans les merveilles naturelles comme l'Echo Point, les Three Sisters, Jamison Valley et les chutes de Wentworth. Cette excursion proposée aux voyageurs de 18 à 39 ans comprend des vues panoramiques, une promenade dans le bush, une pause baignade et un barbecue traditionnel australien. Tous les prix du parc national et le transport sont également inclus. Rendez-vous par vos propres moyens au Kings Cross Holiday Inn ou au Sydney Central pour un transfert matinal, où vous retrouverez votre guide et le groupe de 20 personnes maximum. Le voyage vers les Montagnes Bleues dure environ une heure, vous pouvez donc en profiter pour dormir ou choisir quelques morceaux entraînants à mettre sur le système audio, ou apprendre à connaître vos compagnons de groupe. Après une courte halte pour acheter des boissons et en-cas (facultatif) dans un village shopping, vous arriverez dans le parc national des Montagnes Bleues, préparez votre appareil photo et descendez pour apercevoir les kangourous sauvages. Vous continuerez à monter les routes de montagne jusqu’aux chutes de Wentworth, l'une des merveilles naturelles du parc les plus photographiées, puis vous suivrez votre guide pour un trajet panoramique dans le bush autour des chutes, avec l'opportunité de vous arrêter pour une baignade. Vous aurez le temps pour un arrêt au point de vue de l'Echo Point avant le déjeuner, pour profiter des vues spectaculaires sur les célèbres formations rocheuses des Three Sisters. Après avoir posé pour la photo devant la magnifique Jamison Valley, asseyez-vous avec votre groupe pour savourer un délicieux déjeuner-barbecue australien. Vous aurez le choix entre de la viande et des options végétariennes, mais vous aurez également la possibilité de déguster des spécialités locales australiennes uniques, du steak de kangourou. Après le déjeuner, vous continuerez jusqu'au point d’eau où vous pourrez sauter ou vous étendre sur le sable. Vous descendrez ensuite une longue route boueuse pour dire bonjour à Skippy le kangourou. Après une journée complète dans les montagnes, vous retournerez en ville, où votre excursion se termine par un transfert vers Sydney Central près de Side Bar. Good tour to see a little glimpse of the blue mountains. The climb back up was quite steep but nothing a relatively healthy middle aged person cannot do. Good trip with a really funny guide. We were unlucky with the weather because it was foggy. But we saw the water falls, some part of the montains and wild kangaroos so overall it was great. Also saw a wild snake in the montains which was really cool. I recommend it to young people below 30 years (or if your young in your mind). Thanks for a good trip! We had a blast. Great Blue Mtn sights, kangaroo in the wild, cockatoo, trail hike fairly easy, waterfalls, fun facts, good BBQ even Kangaroo. Threw a boomarang! Foggy that day, so couldn't see 3 Sisters, but great photo shoot in curio shop, makes us look like we were there creative huh! Good morning coffee shop and fun neighborhood pub in Sydney at the end of the day. Only, we were the oldest couple on the bus............, by 30 years. Ha! This tour group is oriented for 20/30's. But, we kept up! So, take that millenials! Hugs! This was an awesome experience! We loved spending the day with the Coast Warriors. The guides are great! Super fun and are the type of people you'd want to hang out with. Brilliant day out, one of our favourite days in Sydney! Trent and Ade were great guides, took us to all the best spots that you’d only find being with the locals. BBQ lunch was spot on. The swimming spot at the end was idyllic, perfect end to a perfect day. Absolutely amazing!!! The guys that take you on the tour are fantastic, friendly, funny and informative. There was a lot more to the tour than I thought there would be. I would highly recommend it. I was a solo traveler when I booked this tour and was hesitant at first doing it on my own. I was so wrong! This tour did not feel like I was on tour with a bunch of strangers. The guys were great and actually took the time to know you. They know so much about the place you are visiting and took us to various spots where not a lot of tourists go to so that was a bonus. It was a fun hike going down to the falls but be prepared for the hike back up. Lunch was amazing! The bus ride was also filled with good music and even a trivia game. More bonus points towards the end of the tour when we all went down to a local bar and were provided with free drinks and snacks over more travel related conversations. Definitely will go back for this tour! I took this tour in February 2017 and I would highly recommend it! I felt that it was very good value for money. The brothers were very friendly and kept us entertained throughout the tour. I imagine it is suitable for all ages, but the tour felt more suited to the 18-30 backpacker audience. As well as a great trip to the Blue Mountains despite how foggy it was!, we were taken to a wonderful viewpoint looking down over Sydney and a secluded beach. Lunch was genuinely delicious. 10/10. Incredible! Can't imagine a better way to experience the blue mountains!! The guides were very knowledgeable and always up for a laugh. They made it feel like a day trip with friends rather than an organised tour. Truly had the most amazing time!! !